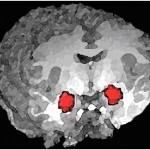 Feb. 6th, 2012 – The brain’s quick interceptions help you navigate the world – When you are about to collide into something and manage to swerve away just in the nick of time, what exactly is happening in your brain? A new study from the Montreal Neurological Institute and Hospital – The Neuro, McGill University shows how the brain processes visual information to figure out when something is moving towards you or when you are about to head into a collision. Feb. 5 2012 – Researchers at the Robert-Giffard Research Center of Université Laval have just shed new light on the regeneration of brain neurons. The work of Lusine Bozoyan, Jivan Khlghatyan and Armen Saghatelyan, published in the February 1st edition of the Journal of Neuroscience, demonstrates the role played by cells called astrocytes in this mechanism. Jan. 17, 2012 – A devastating neurodegenerative disease that first appears in toddlers just as they are beginning to walk has been traced to defects in mitochondria, the ‘batteries’ or energy-producing power plants of cells. This finding by a team of researchers, led by investigators from the Montreal Neurological Institute and Hospital – The Neuro- at McGill University, was published in this week’s issue of the Proceedings of the National Academy of Sciences of the USA (PNAS). How do we split our attention? Imagine you’re a hockey goalie, and two opposing players are breaking in alone on you, passing the puck back and forth. You’re aware of the linesman skating in on your left, but pay him no mind. Your focus is on the puck and the two approaching players. As the action unfolds, how is your brain processing this intense moment of “multi-tasking”? Early MRI scans can help predict the diagnosis of multiple sclerosis (MS) in children, which may permit earlier initiation of treatment, according to a new national study. December 1st, 2011 – In an article published today in the prestigious journal Science, a team of researchers led by Dr Alexander Prat and postgraduate fellow Jorge Alvarez at the University of Montreal Hospital Research Centre (CRCHUM) sheds light on how the blood-brain-barrier (BBB) works to prevent the incursion of the immune system into the brain. November 14, 2011. – A research team from Université Laval, led by Jean-Pierre Julien, has taken a new step in understanding the cellular mechanisms involved in Lou Gehrig’s disease, also known as amyotrophic lateral sclerosis (ALS). This disease is characterized by degeneration of neurons that control muscle activity. October 21st – New research reveals how we make decisions. Birds choosing between berry bushes and investors trading stocks are faced with the same fundamental challenge – making optimal choices in an environment featuring varying costs and benefits. Researchers in the Hotchkiss Brain Institute (HBI) at the University of Calgary’s Faculty of Medicine have uncovered a mechanism by which stress increases food drive in rats. This exciting discovery, published in the journal Neuron, could provide important insight into why stress is thought to be one of the underlying contributors to obesity. September 19, 2011 – The Canadian Task Force on Preventive Health Care recommends routine screening for depression during primary care visits when systems are available for coordination of assessment and treatment. An article by an international panel of experts, published in the October issue of the Canadian Medical Association Journal, argues that there is no evidence that screening benefits patients and that, moreover, implementation of the practice would further burden an already financially-strapped health care system. August 16, 2011 – A new analysis, published in the British Medical Journal (BMJ), reports that flawed research studies have exaggerated the degree to which depression screening questionnaires are able to accurately detect people with untreated depression. The number of untreated patients who would actually be detected using these questionnaires may be less than half the number predicted by existing studies. August 15, 2011 – Researchers think that brains are sensitive to the quality of child care, according to a study that was directed by Dr. Sonia Lupien and her colleagues from the University of Montreal published today in the Proceedings of the National Academy of Sciences. July 20, 2011 – Dr. Ed Ruthazer is a mapmaker but, his landscape is the developing brain – specifically the neuronal circuitry, which is the network of connections between nerve cells. His research at The Montreal Neurological Institute and Hospital – The Neuro at McGill University, reveals the brain as a dynamic landscape where connections between nerves are plastic, changing and adapting to the demands of the environment. July 20, 2011 – The 22nd annual Neuronal Plasticity Prize of the Fondation Ipsen has been awarded to Robert J. Zatorre (Montreal Neurological Institute, BRAMS Laboratory), Isabelle Peretz (University of Montreal, BRAMS Laboratory) and Helen J. Neville (University of Oregon, Eugene, USA), for their pioneering research in the domain of “Music and Brain Plasticity”. July 14, 2011 – Researchers at the Institut de recherches cliniques de Montréal (IRCM) are among the many scientists around the world trying to unearth our nervous system’s countless mysteries. A new piece of the puzzle was recently uncovered by Dr. Artur Kania, Director of the IRCM’s Neural Circuit Development research unit and Associate Professor at Université de Montréal’s Department of Medicine, and a postdoctoral fellow in his laboratory, Dr. Tzu-Jen Kao. July 11, 2011 – De novo mutations – genetic errors that are present in patients but not in their parents – are more frequent in schizophrenic patients than in normal individuals, according to an international group of scientists led by Dr. Guy A. Rouleau of the University of Montreal and CHU Sainte-Justine Hospital. Dr. Ed Ruthazer rapidly established himself as one of Canada’s most outstanding young scientists. View more recently featured CAN-ACN news and neuroscience news stories. You can also submit a press release or a recently published paper to CAN for consideration.